The graph is composed by the bodies in the simulation and by normal trails disposed according to different data. 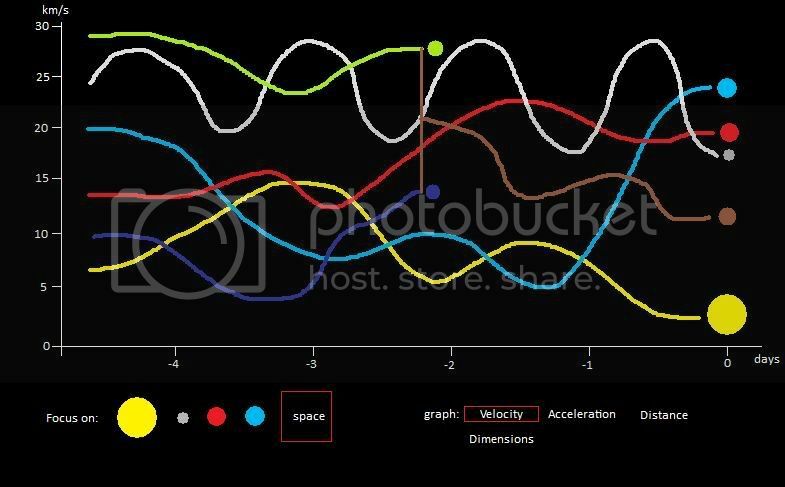 "Focus on": If you select for example the Sun all the trails will become the graph of the acceleration/velocity/distance from the Sun. The Sun will be locked on zero. The "dimension" value will take you back to the normal chart mode, with the direct comparison of the objects. The brown object is the result of the collision between the green and pink planet. After the collision the planets collided will remain in that position to let the user see the original objects. It would be nice if the time and the other values could be scaled both automatically (like the actual time step indicator) and manually. The time is basically the time needed to the trails to disappear, so if you increase the number of trail segments the graph would be longer. It would be nice if the simulation could run in background so that you can see the evolution of the graph in real (= simulated) time. Although, I don't see where the pink planet is. I think the first map might be based upon height data created by radiographic measurement of the earth. This would means that the surface parts who are close to the satellite (mountains) are coloured red and the rather distant parts blue. The second map looks rather demonstrational since it has a 0 point colour defined. However I'm not entirely sure about the colour controversy. I think I've seen a lot of maps based upon radio data which used blue / violet as colour to indicate maxima. But it might be that researchers just choose the way the color range goes after their personal preference. But this only describes how much frames should be saved as screenshots per second, right? What I'm rather thinking of is letting US take one screenshot after every 60 or 30 seconds, or any user wanted time intervall. Wow I love your idea. However Dan, if you consider adding any time based stats tracking similiar to this also add an option to disable. I do suspect that I might cost a lot of performance in large system. The very interesting thing about the 2D grid is that it shows in acceleration mode during the first seconds a gravity map of all massy objects. You can even see the low gravity zones in which some of the lagrange points are situated It might be really interesting to introduce some sort of fixed and improved version of that 2D grid for gravity mapping. The little yellow dot between the Earth and Moon is actually where L1 is situated. Thinking about including it, I think the first and simplest way would be simple to introduce a slice of very dense ordered but fixed particles. Like the current 2D grid. However it could be selected and simply moved around the dimension. Or rotated. The number is the number of frames that are calculated before the screenshot is taken. I like the gravity mapping idea! I thought this would be cool to show with a grid effect too! Ok, I didn't knew that the movie mode was working the way FGFG described it. I think it's fine how it currenlty is. So there is no need for sceen caps based on simulation time. 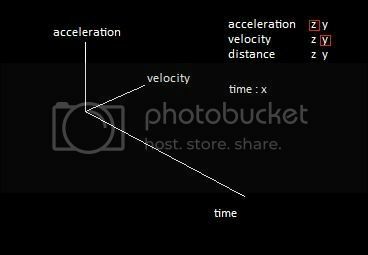 Collisions between objects are ignored and don't have an impact on the velocities. The idea behind this is to include a sprite mode. When it's turned on it visually replaces spherical 3D objects with circular sprites of the same size. But I don't know if that mode would make any sense, since the only use for it would be performance improvement, and I can't make an estimation if it would be helping or not. There's a difference to what am I talking about. The highlight mode is mainly there to help you detecting planets in unclear systems. Highlight circles also stop to scale down at large distances and also overlap all objects. cover each other, scale completely down on large distances and are sized according to the radius of the planet. A galaxy collision that can be merged. Awesome idea. No promises for version 2, but it's on the must do next year list. I'll write up more commentary and respond to the other ideas in the thread tomorrow. I've also been experimenting with a new feature that I think everyone's going to love playing with. It was some years ago as I had access to some content made especially for schools. As I remember there were semi-dynamic applets, which allowed you to change some stuff. A lot of things were especially made in a presentational style, almost like an animation. A bar chart which can be activated for an object and represents two bars showing the kinetic and potential energy in comparison. This would be especially interesting for elliptic orbits. Since the kinetic rises depending from the point of the orbit same for the potential energy. Demonstrating which voltage is needed and how much work has to been done to move an object from point A to point B. Overall I think about opening Work Group threads, in which people thinking about different aspects / goals of US can post their ideas. A radius which can be set to a parent object, which automatically removes every particle which travels across a specified radius. Since this way particles which left the system would be removed while at the the same time the performance of the simulation would be boosted. As soon as a particle has reached the escape velocity of the system it automatically becomes removed. This basically prevents the existance of particles which won't interact with the system again. However unlike A) this would still allow the existence of particles with a very large orbit. Objects could have a magnetic field. Other celestial objects could be turned into emitters of charged particles, meaning that the interaction of planetary b-fields with solar particle storms could be simulated in their basic appearence. Just allow it users to draw selection boxes (with a tool?) and simply allow users select multiple objects by holding shift and clicking on multiple objects. I will definitely be improving the accuracy of projected paths in the next version. Thanks for the diagrams bessy. And I've been waiting for someone to mention multiple selection of bodies... I've been thinking about it for some time... I'm thinking about it for version 2, but no promises yet. That could be interesting. Definitely thinking about it. DO YOU MEAN THE ''watch everything building up'' UPDATE?!!! how about a timeline so stars turn red giants and go nebulae or supernovae deoending on gtheir masses and eventually become white dwarfs, black dwarfs, neutron stars or black holes. i think a feauteure like this should be optional though because not everyone wants their system to explode! Gases are released on their poles. Shinier then the star. When the object gets "sucked" in, the black hole haves Extragalactic Jet going off at its poles. Also, I just want the black hole in a regular way (meaning that when objects get sucked in, I dont want it to be bigger), and the Accretion disk. They are simple and can grow on habitable planets, take off in their ships (once they build up to that level) and explore the solar system. its almost impossible to make, and its realy hard to script/make that. if it would be in Universe Sandbox 2 or later, it would be awsome! if you realy want to simulate it, play OMNI IV. I think monmarfori means is that time steps should be able to go in reverse! This would be useful with a Saving system probably. Be cool to see a collision over and over.